Snohomish County is in the northwestern area of Washington State, nestled between the beautiful waters of the Puget Sound and the jagged snow covered peaks of the Cascade Mountain Range. Snohomish County's southern edge is 12 miles north of Seattle, and just 100 miles south of Vancouver B.C., while being short ferry ride away from the beautiful San Juan Islands or the Olympic Peninsula. Snohomish County is perfectly situated for exploring the complete Pacific Northwest. Snohomish county has some of the best scenery the United States has to offer, with forest and mountain wildlife sanctuaries and unlimited places for outdoor recreation, plus the best tasting coffee west of Italy. 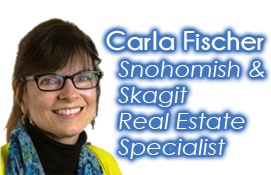 If you are in the market for a place to call your home there is an active real estate market in Snohomish countywith vacant land, homes, condminiums, and waterfront property in a vast amount of locations throughout the county. Contact me today for a tour of properties that interest you today.